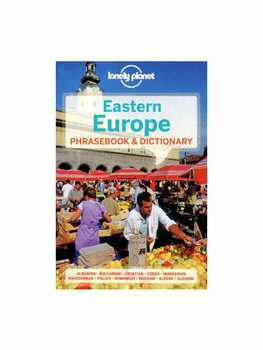 We use Lonely Planet phrase books whenever we roam outside of Europe's core English-French-German-Italian-Spanish-Portuguese language zone. This pocket-sized volume will help you connect with the locals in Warsaw, Prague, Bratislava, Budapest, Ljubljana, Dubrovnik, St. Petersburg, Bucharest, Sofia, Skopje, and Tirana — and everywhere in between. With roughly 50 pages devoted to each language, this does not offer the depth of Rick Steves' phrase books — but it's great at covering the basic essentials of pronunciation, health, courtesies, getting around, shopping, eating, and sleeping. It's an ideal companion to the Rick Steves Eastern Europe guidebook. Dimensions: 5 ½" x 3 ¾" x ¾"